This is part two of however many parts I feel like doing on old expressions of classic Blended whiskies, it really boils down to how many of my old bottles I feel like opening. Everyone will know how much I enjoy White Horse, the standard modern blend is my favourite below twenty quid blends and I have no idea why it’s not sold in supermarkets along sides Teacher’s, Whyte and Mackay or Famous Grouse. 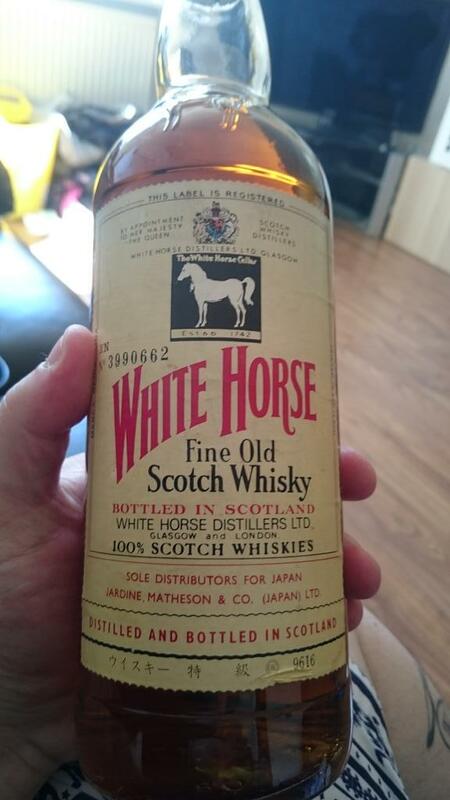 This however is a bottle for the Japanese market bottled at 43% either from the late 70s or early 80s and is a totally different whisky and like all older versions of White Horse is well worth hunting down at auction or at some specialist whisky shops. Nosing this and you get the feeling there is a lot more Malt happening here, chocolate and coffee, orange, clove and ginger and a little smoke from Islay, lovely heat. Taste and again we have baked fruit, toast, black tea, a touch of Islay peat but not loads, pickled Ginger, little bit of all spice after I’ve got through a quarter of the bottle, the bottle has now had some chance to breath and it releases far more warmth. Finish and we have more spice and a little heat, All Spice again and a lengthy finish rare for blends these days. So another wee review but I’m going to chuck out a few warnings, as with all older blends you’ll see these sell at auction but the prices are going up, I’m seeing bottles of Johnnie Walker Red label selling for over fifty pounds and to the point it’s probably not worth it, personal choice of course but I would be wary.